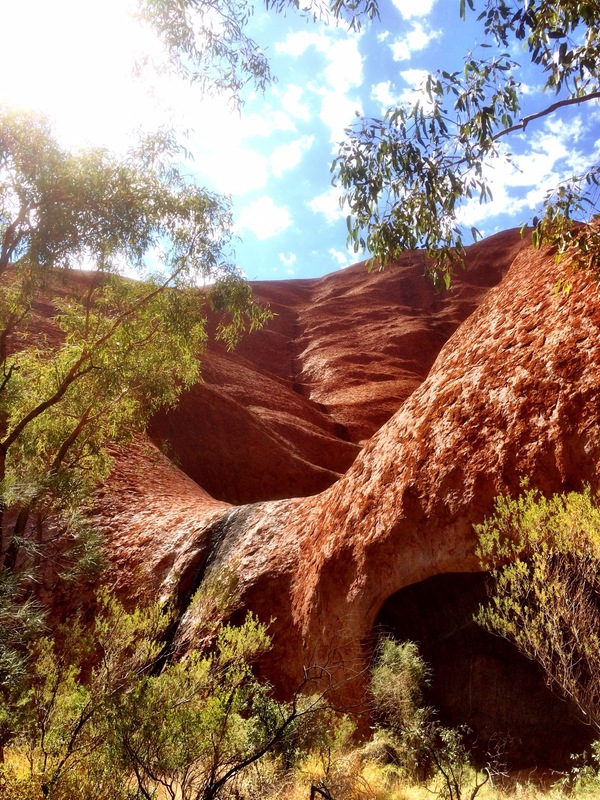 We now travel to the red centre of Oz, Uluru & Kata Tjuta for a few days, then followed by Kings Canyon. We notice that all these places have a different vibe to what we’ve experienced before on this trip. There are lots of people here. There’s lots of international people and school groups as well. With the resort accomodation around, there are also some nicely dressed people around. 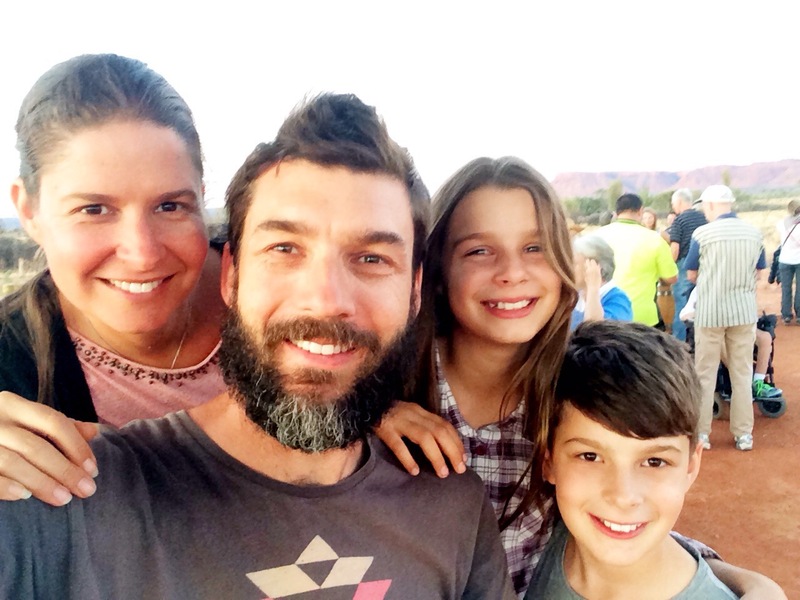 And at Uluru they even have fireworks at night. 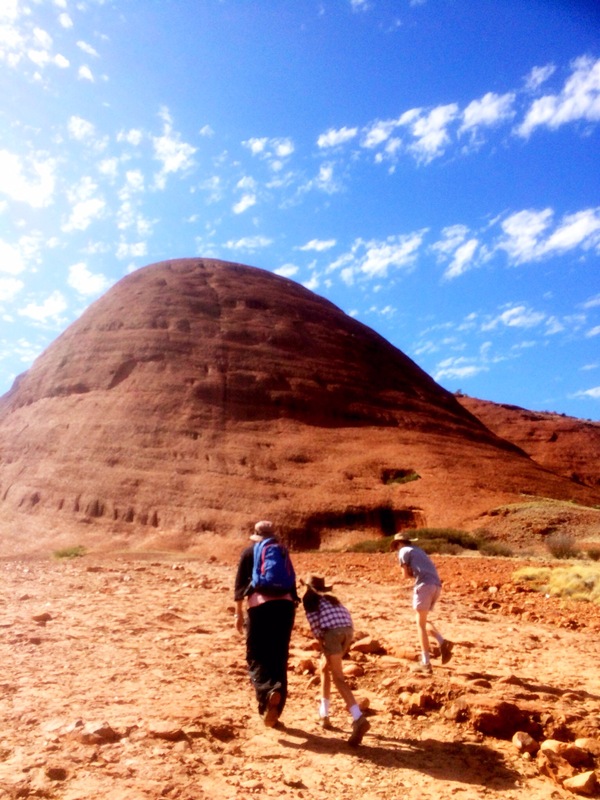 For the 3 days that we’re at Uluru we are the least active we’ve ever been. I think we’re tired and happy not to go hard all day, every day, so we do something in the morning and then just vege out at the tent in the arvo. It doesn’t help that Amelia has a cold and is struggling a bit. This is the part of the trip that Amelia has been looking forward to the most. We hope feeling sick doesn’t take too much away from the experience for her. For the first morning here, we take a Ranger tour around the base of the rock, explaining some of the rock art and cultural significance of the rock. 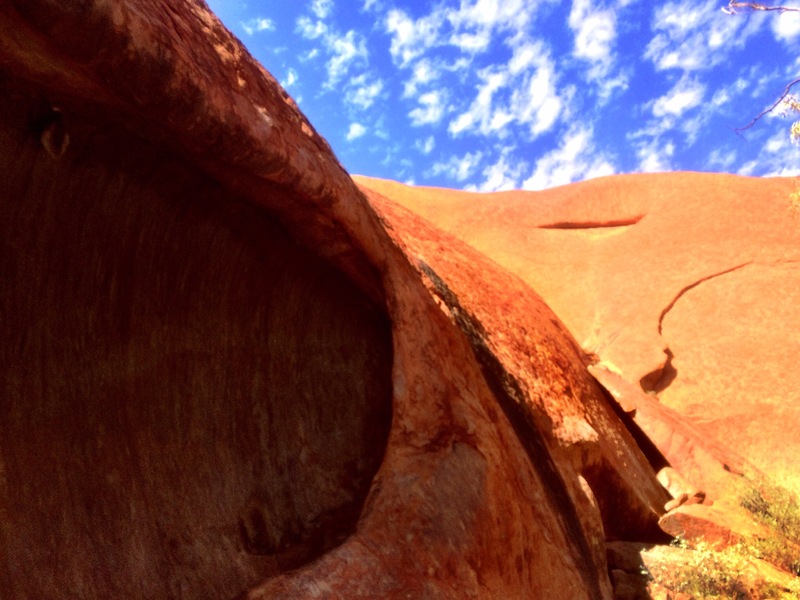 Uluru is sort of mesmerising, both from a distance and when you’re up close. We never knew the rock was ‘scaly’. 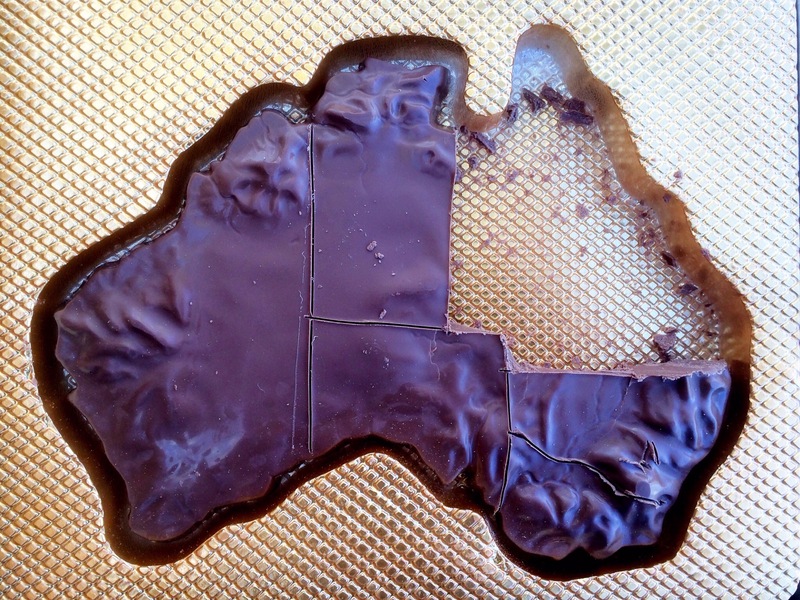 Back at Margaret River Chocolate Factory we bought a chocolate Australia so in the arvo back at camp we start on it. Here’s some added skittles to show our trip so far. And being Queenslanders we eat our own state first. 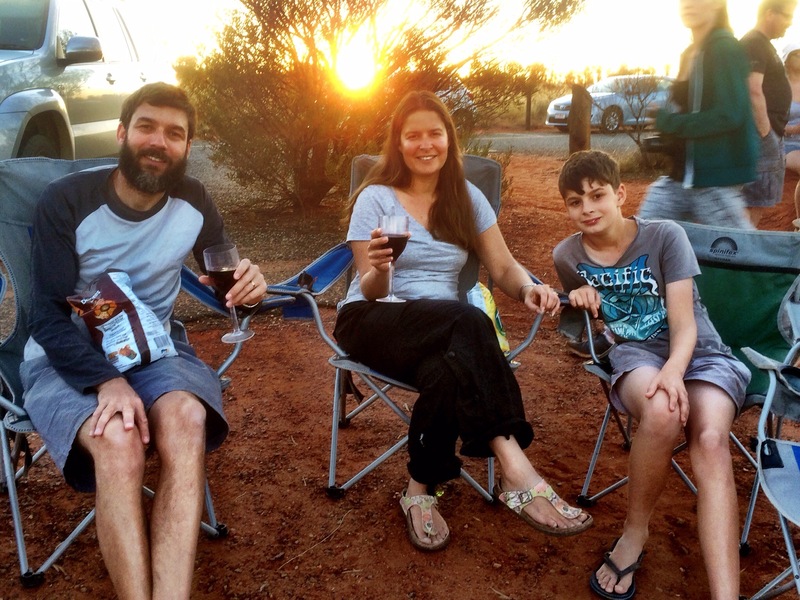 We do drive back for a sunset view of Uluru. 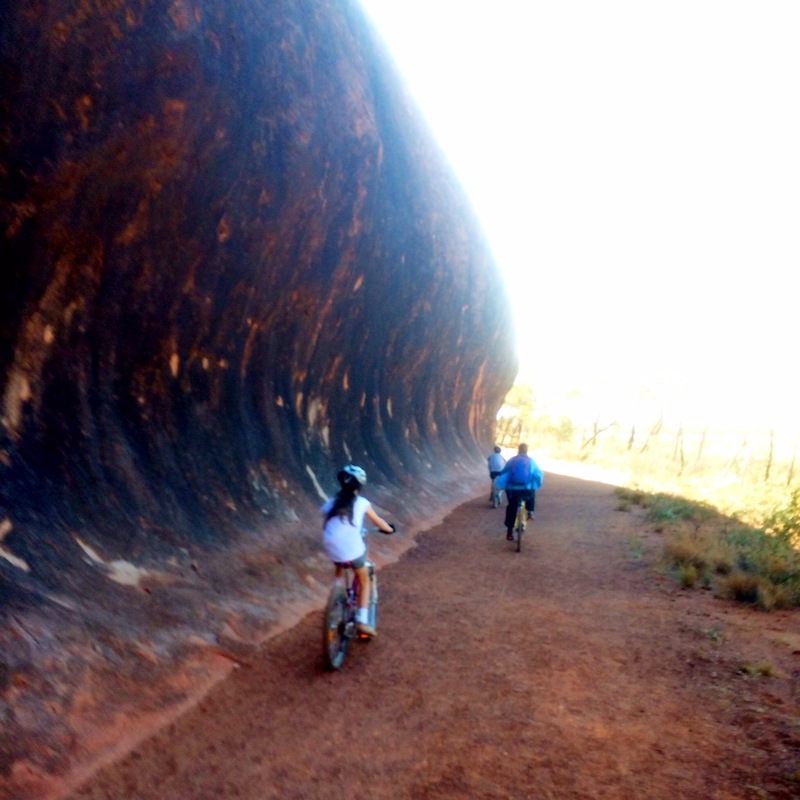 The next day we hire bikes to go around the rock. 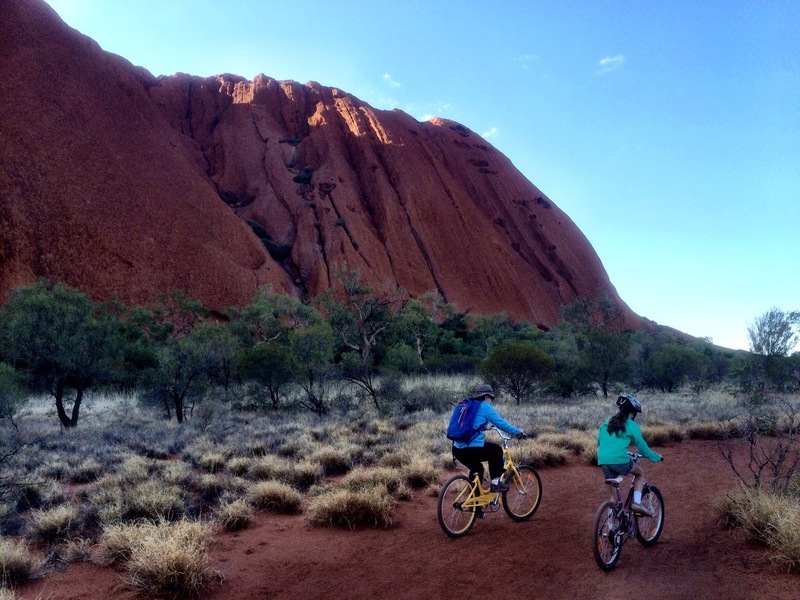 Given our state of being while here, we’d rather ride the 12km than walk it. We don’t see much of Noah during the bike ride. He zooms off to be point-man explorer guy. 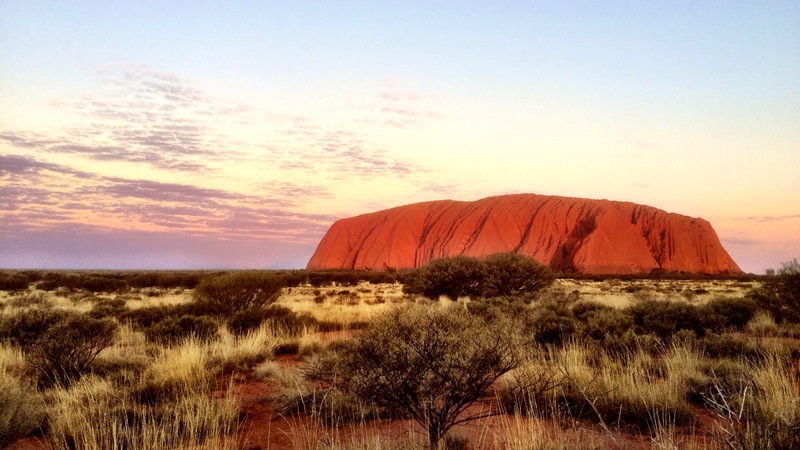 Each afternoon at Uluru Amelia always crashes a bit with the cold she has right now. This is a moment when she needs a cuddle from her Mum. 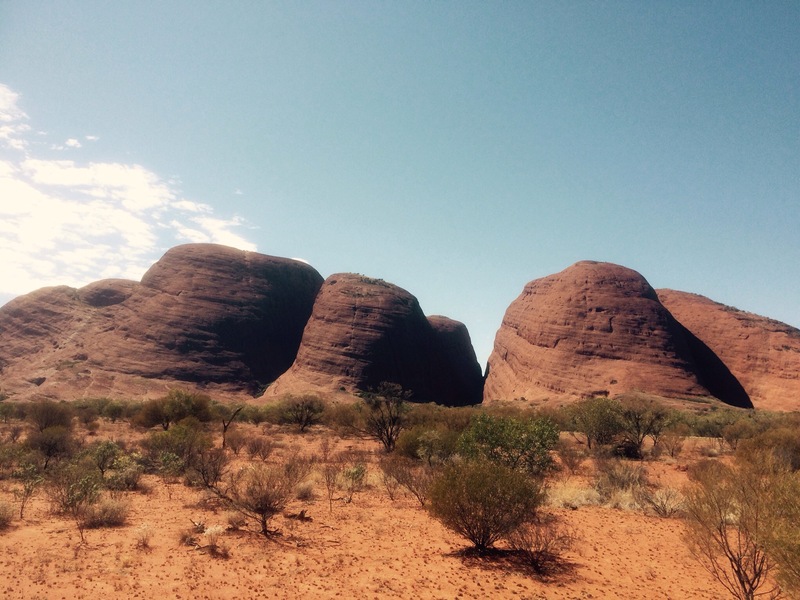 For our last day at Uluru we drive out to Kata Tjuta (the Olgas) and we do a couple of short walks. We were thinking of doing a longer walk, but Amelia just isn’t up to it. 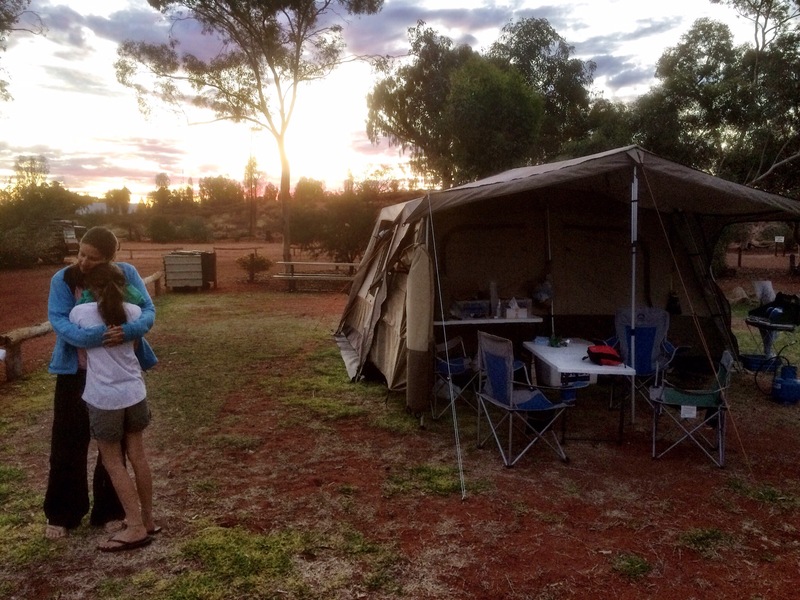 We get back to camp from Kata Tjuta, fill up on supplies and start packing up the tent. At this point we notice that we don’t have the green matting we normally use in front of the tent. We decided not to use it at Uluru since there was enough grass, but it seems I left it on the roof when we drove around Uluru, so it’s flown off somewhere. Oops! 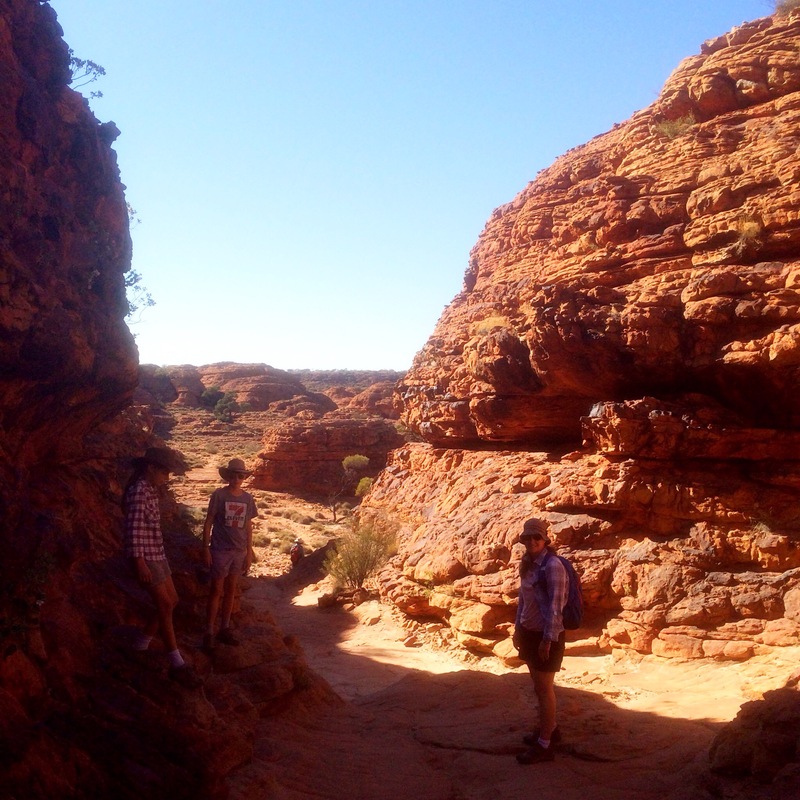 We head out to Kings Canyon, to have a couple of nights there. On our drive to Kings Canyon we’re listening to InkHeart. Recently we’ve done – The Hobbit and The Wind in the Willows. 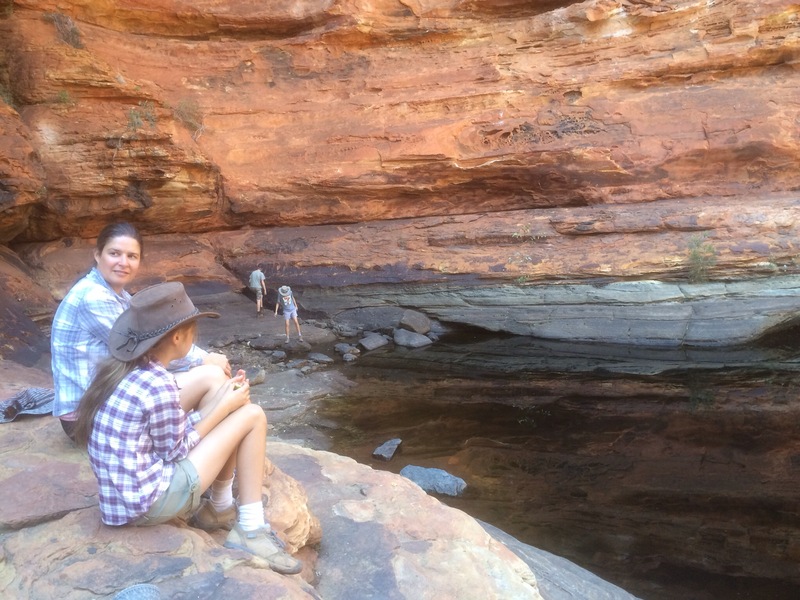 We have a couple of nights at Kings Canyon. For our first arvo here we wander up to the sunset viewing lookout point. My iPhone doesn’t take good photos of things that are far away, so here’s us instead. There’s a dingo wandering around here looking for an easy feed so we have to keep all our food locked up. Apparently she also takes shoes so they stay in the tent at night to. The next day we do the Rim walk around the canyon. It is a four hour walk so we start early before it gets too hot. Lots of people are enjoying this spot with us, with school group and a couple of commercial tour groups. 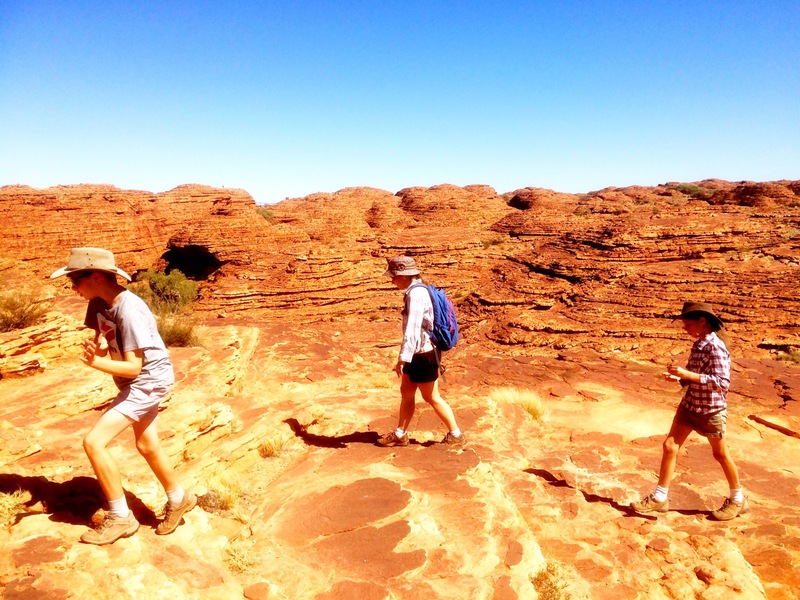 Some of the landscape here reminds us of the Bungle Bungles. 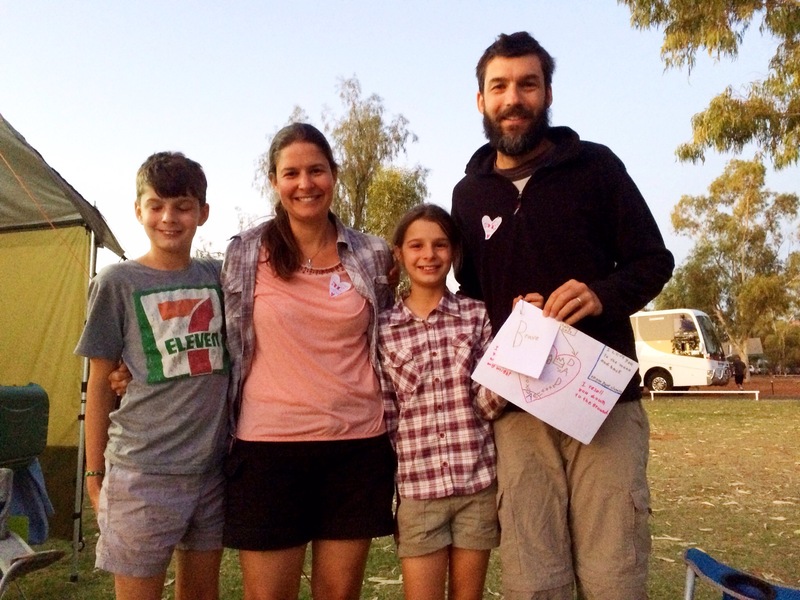 In the arvo we meet Andrew who is travelling by himself. We have him over for dinner and we hear his story. Today is also our wedding anniversary. 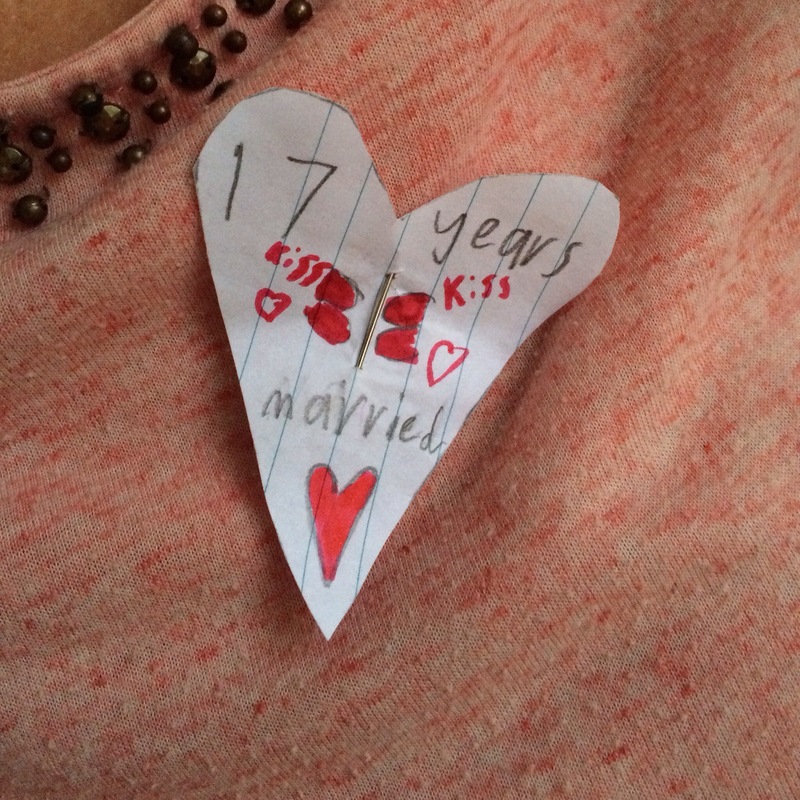 The kids wanted to make us some anniversary gifts. Thanks kids! It must be a Queenslander thing – repeating the same mistake of 1988. 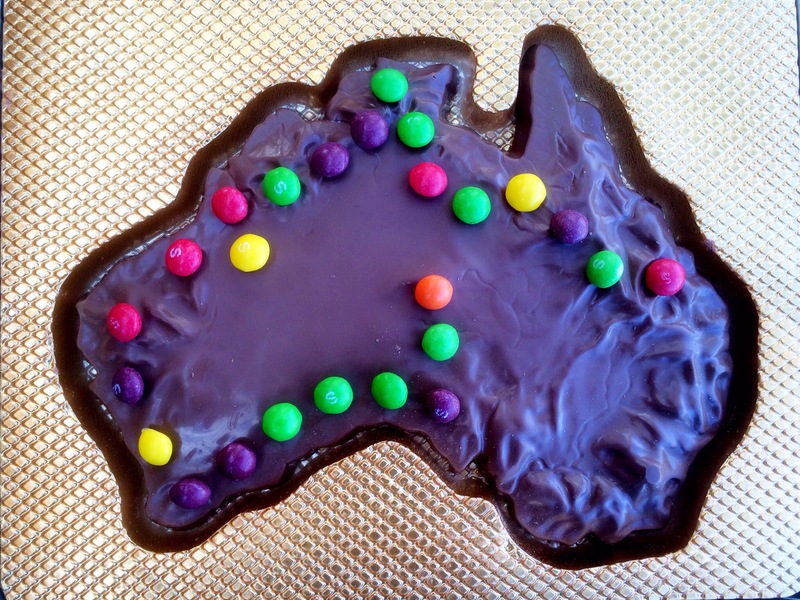 On your cake of Australia you’ve left off one of the states – Tasmania. Thankfully I don’t imagine you have many Tasmanian viewers. Thanks for drawing in the ACT! Hey don’t blame us. Blame Margaret River Chocolate Company. We certainly wish they included Tasmania. It would have been delicious. Good to hear from you Andre. I thought Qlders would eat NSW first? I like your kindness to solo travellers. Ha ha. NSW will be decimated to tomorrow, in symbolic remembrance of the state of origin result.